Several years ago, in my homeschool-mom life, Cheryl and I bonded in history class while teaching. It's been two years since I retired. My girls are in college now and I miss all my old friends... Sniff. But, I'm okay. Anyway, where was I? Oh yes... Cheryl and I met for lunch to catch up. She suggested Cafe 37 and I'm so glad she did! It was my first visit to the popular downtown venue. 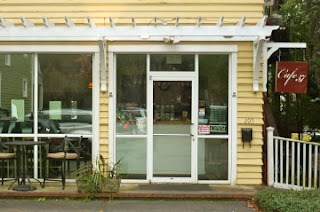 It is located behind 37th At Abercorn Antiques. 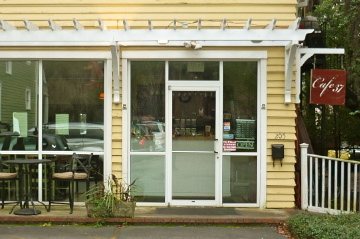 The cafe is the property's former carriage house and has a scant eight tables. I arrived early and selected a lovely table next to the huge front window. After perusing the menu, I settled on a half of the Garden Salad, choosing to top it with sauteed shrimp. 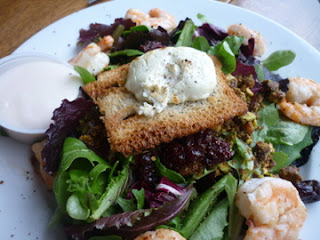 The salad is comprised of mixed greens, wild arugula, dried cherries and sprinkled with decadent candied pistachios. A baked crostini with a dollop of melted goat cheese was nestled in the center of my salad like a jaunty beret perched atop a Frenchman's head. 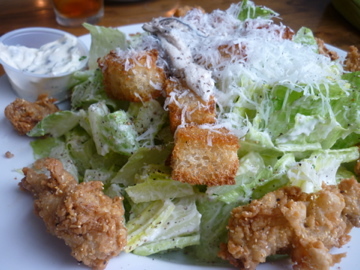 Cheryl selected the Caesar salad with fried oysters, saying that they were fabulous. She was gracious enough to let me try one... aMAZing! The menu, while decidedly French features diverse choices. The ladies lunching next to us settled in with their own tiny, oval crocks of French onion soup... I was slightly jealous. 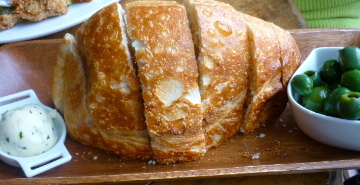 The fun thing about dining at Cafe 37 is that shopping can be involved, if you are so inclined. Right across the parking lot is the antique shop! 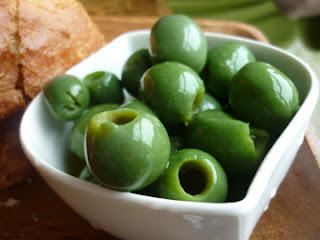 What better way to walk off the wonderful homemade sourdough bread and smoked olives we ate with our salads. The Cafe is open for breakfast and lunch. Dinner is served Thursday, Friday and Saturday. Brunch is on Sunday. Reserations are suggested. We saw firsthand how popular it can be. Click here for a look at their website.